Emily McDonald is an expert on picnics. 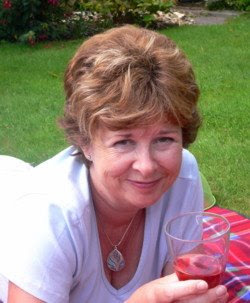 She runs The Picnic Site, a site that (as you might guess) tells you everything you might want to know about picnics. Emily lives in the south of England, on the Hampshire/West Sussex border, which she says is the perfect place for a picnic. Get your picnic basket ready because after this interview, I bet you'll be ready to head outside and enjoy the day. Emily McDonald doing one of her favorite activities - picnicking! Well, I love cooking. We travel around a lot and so I find I'm making picnics quite often. When I wanted to make a website, I brainstormed topics and picnics sort of came out trumps! I also remember thinking they were difficult when I had a young family. I always got in a bit of a panic when we decided to have one, and so I thought I'd help others who maybe feel this way. There are lots of cooking sites on the Web, and when I started out, not so many about picnics - now more though! What's the first picnic you can remember being on? Newcastle beach, County Down, Northern Ireland with my sister and parents and another family. I must have been about eight. I know there were others before that because I've seen photos, but I don’t actually remember them. I remember playing in the sand dunes, after eating, which I found enormous fun. I also remember a family picnic when my uncle and aunt visited from Canada - that was in a park somewhere. I've since been to Canada and picnicked there! Did you picnic a lot as a kid? I guess. We didn't have a lot of money, so picnics were a cheap and exciting way of having a day out. Then, when I was a teenager, I used to go camping or picnicking with friends. What makes a meal a picnic? Just not sitting at the table in the dining room or kitchen - I'm about to write a page on the site about a desk picnic - basically a packed lunch! I suppose that most people would say it has to be outdoors, but is that really necessary? Kids enjoy a picnic on the floor with a blanket if it’s a rainy day. In the dictionary, however, it does say it's an al fresco meal. Would you say that any packed lunch not eaten at a table is a picnic? Well, I would probably not always describe it as such, but it could be! What’s your best picnic story? The picnic I remember the most is when my husband and I first got together and I had to meet his kids (then 3 and 11). I decided to make a picnic. We'd take them out once we'd picked them up from their mother. I remember cooking chicken drumsticks among other things, but it isn't the food that I remember. My husband was rather unpracticed at looking after the 3 year old (a girl) and when he helped her do a "wee wee" they managed to get her knickers soaking wet. We drove home with them attached to the car aerial to dry before we handed her back to her mum. Now, I look after our granddaughters (4 and 5) when we take them out! Another picnic I remember well was when my husband and I had a romantic meal in Windsor Great Park and then I had to drop him off at the airport. I had a car crash on the way back and ended up in hospital with all sorts of broken bits! Firemen cut me out the wreckage - I like firemen! Nothing to do with picnics really, I'm afraid! I'm fine, now, but maybe that broke my ears, too! Was your hearing fine before then? Yes, but it has just got gradually worse and worse - could be the loud music I listened to as a teenager, too! My mum is 82 and can hear better than me. Emily recommends keeping your picnic simple: bread, cheese, wine, and fruit. 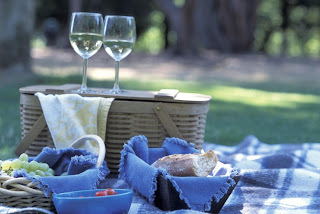 What advice do you have for a person going on his or her first picnic? Keep it simple - bread, cheese, and a nice bottle of wine - maybe some fruit. It depends what sort of picnic really - just partner, or kids. Kids would want different things, but always keep it simple. The kids won't be much interested in the food anyway - they want to run around and play. Simple, but with quite strong flavours because outside food needs to compete with the al fresco sensations such as the smell of grass or sea, wind or sun. etc. Is there any food that is a definite picnic no-no? You should always be careful with things that will spoil easily and create harmful bacteria - such as mayonnaise. But, with today’s modern cool boxes, it is easier to keep things fresh. Things that break easily too are difficult - like meringues. Even chocolate - loved on a picnic - obviously can be horrid if it melts all over the place! Some cheese is better than others. A runny Brie or Camembert can be wonderful, whereas a hard cheese can sweat and be nasty. I'm sure there are others - I'll think of them when we sign off! A picnic backpack is a great item if you are going to walk to your picnic. What's the easiest way to keep things cool? Keep food in the fridge so that the food is cold before you start. Then, wrap in wet newspaper if appropriate - then a cool box with lots of ice or ice packs. Don't keep opening it at the picnic site. Know what you have in each box and try and only open once or twice at the moment you need it - just before eating. Water bottles can be frozen and used to keep things cold as well as to drink when they melt. I was warned by someone that this might be toxic and put a warning up on my site. Then, I was told that this was a hoax e-mail and it isn't toxic so I'm still hoping that this is true! Anyway, I do it! I live in the UK and we don't have a big problem with heat! Other countries may need to be even more careful. Do you prefer a cool box (cooler) to a classic picnic basket? I use both - a cooler for things that have to be kept cold, but a classic basket or hamper for bread, fruit, and of course the plates and cutlery, condiments, and napkins can be in the basket. Also, it depends on the transportation. Is it by bicycle, by backpack, or in the car? There are so many variables. 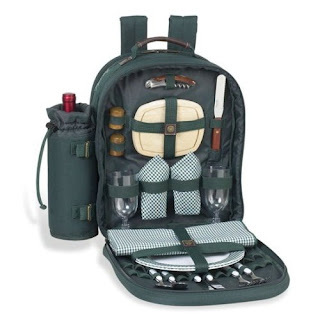 Some picnic sets are in backpacks so that you can walk carrying the picnic and then eat before you walk home again! 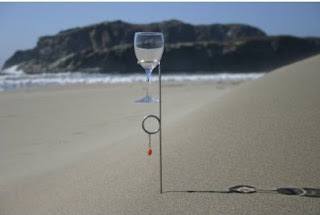 This handy gadget, WineStem, lets you easily keep your wine glasses upright. What is your favorite picnic accessory? Seriously, there is a great little gadget that you stick in the ground which holds your picnic wine glass so you don't lose a drop! Obviously, you can use it for non-alcoholic drinks as well. Also, a cushion - you have to be comfortable when you eat! We don’t always have foldable table and chairs along with us, so waterproof blanket and cushions. What do you do about bugs? Swear! But, apart from that, I take covers to keep food safe from flies and wasps. Ants can be a problem sometimes and they say it helps to draw a line around the tablecloth or blanket with talcum powder - that is supposed to keep them away. But, I must admit I've never done it. I also have on my patio a thing called a Waspinator! It looks like a wasp's nest and so the wasps don't come near - it does seem to work fairly well. You could take it on a picnic and hang it in a nearby tree - it's very light. I found it at a camping show. Always take a garbage bag to clear everything away, and then put it in a convenient garbage bin or take it home. I also take extra plastic bags and paper towels to wrap dirty plates and cutlery in before replacing in the basket. What do you like most about picnics vs. a meal at a table? Just being outside - whether in a field, park, or on a beach - you're close to nature. It's just fun! Maybe more relaxing - slower pace. But, I also love giving dinner parties round the table. Here in the UK there are only a few weeks a year when a sunny picnic is possible and then you never know whether it might rain or not. We are having the worst August in my living memory so I think very few Brits will be picnicking this month! If you love picnics, you have to be prepared with wellies, macs, umbrellas, etc. Not everybody's cup of tea, I admit! But hey, it keeps you smiling - you have to laugh or you'd cry with our weather sometimes! Excuse me being an American - but what are wellies and a macs? A wellington boot (rubber boot) and a macintosh (raincoat). Is the picnic site your full-time job now? Well, I couldn't possibly describe it as a full-time job, but I don't work in the traditional sense anymore, so I guess it's my part-time job! It's more fun than a job. I'd never do it if I saw it as a job. I just love adding to it and getting comments and messages from visitors. I made the site like "painting by numbers" - just followed instructions and had no idea what I was doing really! It's just grown. I don't pay anyone to do anything. Correction - I have just paid someone to set up my USA eBay site. I did the UK one myself but couldn't quite get my head around it again to do the USA one. Lots of modern day chefs I'd love to talk to, but perhaps Mrs. Beeton would be interesting from a picnic point of view - way back then picnics were sooooo different! 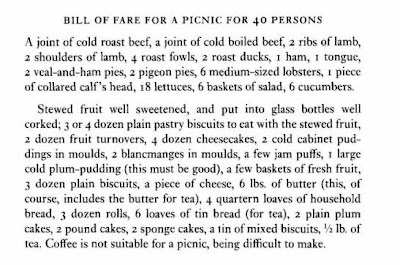 An English writer who wrote one of the very first cookbooks of all time, including how to make picnics - in those days (Victorian I guess) picnics were a very lavish affair which must have been so much trouble for all the kitchen staff. She wrote a book of household management including a picnic menu for 40 people - I can quote some of it: A joint of cold roast beef, a joint of cold boiled beef, 2 ribs of lamb, 2 shoulders of lamb, 4 roast fowls, 2 roast ducks, 1 ham, 1 tongue, 2 veal-and-ham pies, 2 pigeon pies, 6 medium-sized lobsters, 18 lettuces, stewed fruit well sweetened and put into glass bottles, well corked, 2 dozen fruit turnovers, 4 dozen cheese cakes, 2 cold cabinet puddings in moulds, a few jam puffs, 1 large cold Christmas pudding (this must be good)... and so on! Text from Mrs. Beeton's Book of Household Management. These English picnics then became part of colonial life all over the world in the days of servants - who were sent ahead to prepare tents and get the provisions all ready! Those were the days! Now, with no servants to hand, I have to go and think about what I'm going to cook for dinner tonight! Thanks, Jen! I'm so glad you enjoyed it!